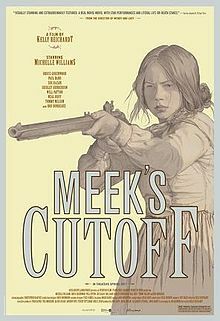 Meek’s Cutoff, a film by Kelly Reichardt, from a screenplay by Jonathan Raymond, is inspired by a real incident. In 1845, a scout named Stephen Meek (Bruce Greenwood) leads a small group of settlers -three men, three women, and a boy – through the Oregon High Desert. The trip takes longer than expected, and the settlers begin to suspect that Meek is lost. The dialogue in this film is sparse. When the characters do speak, it is often in hushed voices, as if they are in awe of the vast, empty landscape around them. (Meek is the only character who ever really gets loud in this film.) As the days drag on, they start to run low on water. They come across a lone Indian (Rod Rondeaux), whom they take prisoner. Meek wants to kill him, but the settlers reason that he must know where water is located. They start to follow the Indian, who doesn’t speak English, but seems to know where he is going. The film is centered around Emily (Michelle Williams). At first she is a submissive wife, (the decisions are all made by the men, without consulting the women) but as the film goes on, she begins to assert herself. She also develops a sympathetic attitude towards the Indian. This film’s abrupt and ambiguous ending comes almost as a shock. Perhaps Reichardt is implicitly criticizing the Western genre’s tradition of having pat happy endings. In True Grit, for example, the bad guys are all killed, and the good guys survive. At the end of Meek’s Cutoff, it’s not clear whether anyone will survive. The film is more about how these people’s experiences are affecting them mentally and physically. The film has a grittiness and simplicity that make it seem more realistic than most Westerns, certainly more so than the fake “authenticity” of True Grit. During the course of the film, the characters’ clothing becomes increasingly filthy, something that is usually not depicted in films about pioneers. The performances are good; Williams is quietly affecting as Emily. This entry was posted on May 15, 2011 at 6:19 am and is filed under Cinema, Native Americans, Oregon. You can follow any responses to this entry through the RSS 2.0 feed. You can leave a response, or trackback from your own site.